Various laboratory tests on bitumen is conducted to check quality and different properties of bitumen for pavement construction. Bitumen is a black or brown mixture of hydrocarbons obtained by partial distillation of crude petroleum. Bitumen is insoluble in water. It composes 87% carbon, 11% hydrogen and 2% oxygen by weight. It is obtained in solid or semi-solid state. It is generally used as surface coarse for roads, roof coverings etc. Then take it out and cut the excess amount of bitumen with the help of hot knife and level the surface. Then place the whole assembly in water bath of ductility machine for 85 to 95 minutes. Then detach the brass plate and the hooks of mold are fixed to machine and operate the machine. The machine pulls the two clips of the mold horizontally and then bitumen elongates. The distance up to the point of breaking from the starting point is noted as ductility value of bitumen. The minimum value should be 75cm. Flash point of bitumen is defined as the point of lowest temperature at which bitumen catches vapors of test flame and fires in the form of flash. 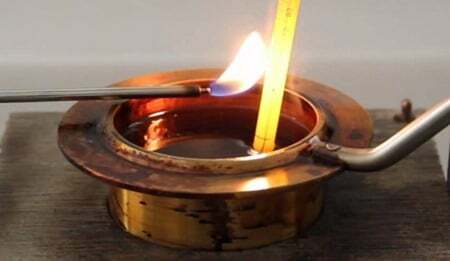 Fire point of bitumen is defined as the point of lowest temperature at which the bitumen ignites and burns at least for 5 second under specific conditions of test. Flash and fire point test helps to control fire accidents in bitumen coated areas. By this test we can decide the bitumen grade with respect to temperature for particular areas of high temperatures. Float test is used to determine the consistency of bitumen. But we generally use penetration test and viscosity test to find out the consistency of bitumen except for certain range of consistencies. The float test apparatus consists of aluminum float and brass collars as shown in below figure. 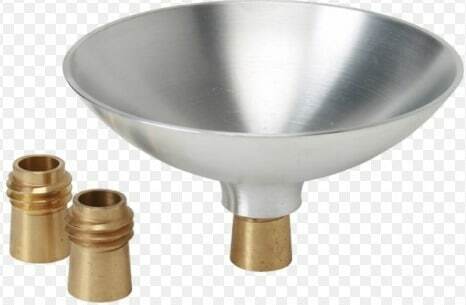 These collars are filled with melted bitumen sample and cooled to 5oC and then attached them into aluminum floats and this assembly is placed in water bath at a temperature of 50oC. Note down the time in seconds from the instant the float is put on the water bath until the water breaks the material and enters the float. When the bitumen is heated, water content present in the bitumen is evaporated and bitumen becomes brittle which can be damaged easily. So, to know the amount of loss ness we will perform this test. In this test, take the bitumen sample and note down its weight to 0.01gm accuracy at room temperature. Then place the sample in oven and heat it for 5 hours at 163oC. After that take out the sample and cooled it to room temperature and take the weight to 0.01gm accuracy and note down the value. Then for the two values of weight before and after heating we can compute the loss of mass. The loss should be less than 5% of total weight otherwise it is not preferred for construction. 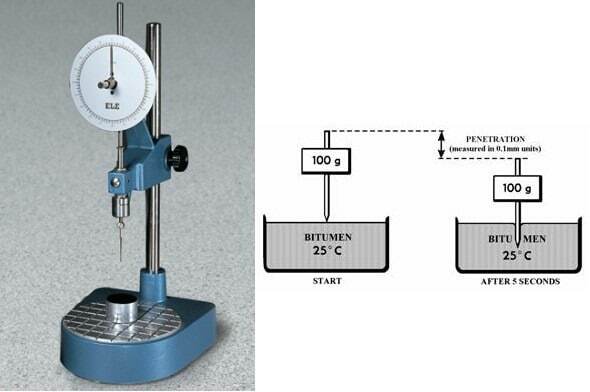 The penetration value of bitumen is measured by distance in tenths of mm that a standard needle would penetrate vertically into bitumen sample under standard conditions of test. By this test we can determine the hardness or softness value of bitumen. In this test, firstly heat the bitumen above its softening point and pour it into a container of depth attest 15mm. bitumen should be stirred wisely to remove air bubbles. Then cool it to room temperature for 90 minutes and then placed it in water bath for 90 minutes. 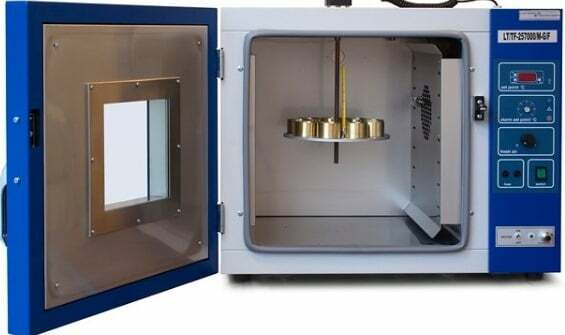 Then place the container in penetration machine adjust the needle to make contact with surface of sample. Make dial reading zero and release the needle for exactly 5 seconds and note down the penetration value of needle for that 5 seconds. Just repeat the procedure thrice and note down the average value. Softening point of bitumen indicates the point at which bitumen attains a particular degree of softening under specified conditions of the test. Take small amount of bitumen sample and heat it up to 75-100oC. Ring and ball apparatus is used to conduct this test. Heat the rings and apply glycerin to prevent from sticking. Fill this rings with bitumen and remove the excess material with hot sharp knife. Assemble the apparatus parts, balls are arranged in guided position that is on the top of bitumen sample. And fill the beaker with boiled distilled water. Then apply temperature @ 5oC per minute. At certain temperature bitumen softens and ball slowly move downwards and touches the bottom plate, this point is noted as softening point. Specific gravity of bitumen is the ration of mass of given volume of bitumen to the mass of equal volume of water at specified temperature. Specific gravity is the good indicator of quality of binder. It can be determined by pycnometer method. In this method, take clean and dry specific gravity bottle and take its weight(w1).in the 2nd case, fill the bottle with distilled water and dip it in water bath for 30 minutes and note down the weight(w2). Next, fill half the bottle with bitumen sample and weigh (w3). Finally fill the bottle with half water and half portion with bitumen and weigh (w4). Now we can find out specific gravity from the formulae. Viscosity is the property of bitumen which influences the ability of bitumen to spread, penetrate into the voids and also coat the aggregates. That is it influences the fluid property of bitumen. 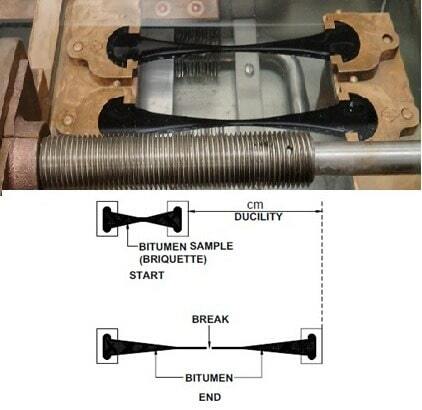 If viscosity of bitumen is higher, compactive effort of bitumen reduces and heterogeneous mixture arises. If viscosity is lower, then it will lubricate the aggregate particles. 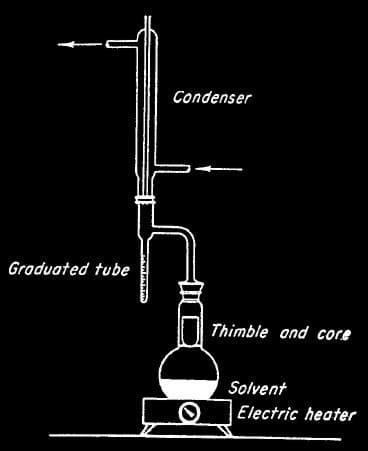 Viscosity is determined by using tar viscometer. 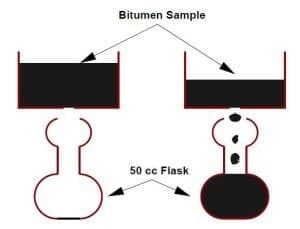 The viscosity of bitumen is expressed in seconds is the time required for the 50 ml bitumen sample to pass through the orifice of a cup, under standard conditions of test and at specified temperature. When bitumen is heated above the boiling point of water, sometimes foaming of bitumen occurs. To prevent this bitumen should have minimum water content in it. Water content in bitumen is determined by dean and stark method. In this method, the bitumen sample is kept in 500ml heat resistant glass container. Container is heated to just above the boiling point of water. The evaporated water is condensed and collected. This collected water is expressed in terms of mass percentage of sample. It should not more than 0.2% by weight.